When I learned that FacebookÂ When I learned that Facebook shrinks any photo larger than 100K, I realized that a better way to preserve and share my photos is to upload directly toÂ dotphoto, andÂ thenÂ share a few photos to Facebook. That way, I preserve the full size of the original photo, and can crop or add text to it onÂ dotphotoÂ before sharing the smaller, edited image on Facebook. dotphotoÂ runs beautifully on a phone from your browser. Here is a screen shot showing a photo of a frozen fountain that I took last week in Atlanta. On phones, your albums and images appears under the main command bar, and can scroll up and down. To see a larger photo of the fountain, you would tap the thumbnail. 1. Most phonesÂ shareÂ dotphotoÂ images directly to Facebook. Hold your finger on the photo (“long-tap”) to reveal sharing options including Facebook. 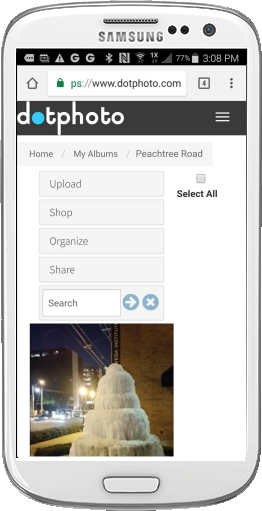 2.Â UseÂ dotphoto‘sÂ Share feature. In the image on the right, you can tap the share button at the bottom of the list to reveal green buttons that copy either a link to the album thumbnails or a link to theÂ dotphotoÂ slideshow. Copy the link of your choice, and paste the link into your Facebook post. 3.Â Copy and paste an image. On your computer, copy theÂ dotphotoÂ image and simply paste it into your Facebook post. Facebook will downsize the image on Facebook for sharing, but you will still have the full-size version onÂ dotphoto.